There is a very nice tribute to your parents beneath all the ‘boo hoo hoo, I wasn’t popular in HS’ blog posts. they won’t be alive forever and i hope they know how good they were. Well… he’s right. While there’s a lot of self-absorption in what I have written…my musical tastes and appreciation was undeniably affected by the music my parents listened to and introduced me to when I was a kid… some of the first music I was ever exposed to. For the most part, the music that my parents introduced me to can be summed up in 2 genre/formats: classic country and oldies/rock ‘n’ roll. My most vivid memories are of Dad playing the country music records, tapes, and 8-tracks and my Mom listening to the oldies 45s, LPs, and radio. While my Dad just simply played the music he most appreciated, I do remember my mom making it a point to to expose/introduce me to the music of her youth. Mom gave me my first radio: an old clock radio she bought at a garage sale. I don’t really remember music much before that… but somehow I had already had a short stint with a child’s drum set and knew how to hold and strum my magical musical thing like a guitar. But getting a radio of my own certainly began the process of opening me up to music fully… started a passion for it that would guide the rest of my life. 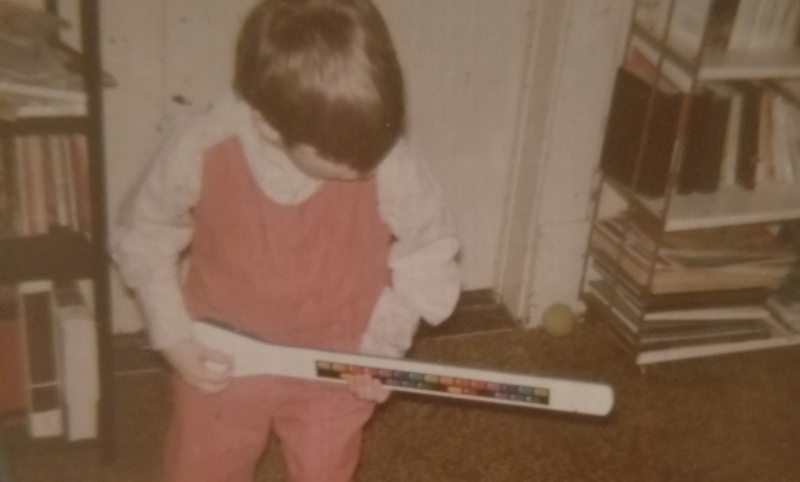 Shortly after getting that clock radio, I received my first Fisher Price tape recorder for Christmas, and then Mom gave me some tapes, saying that the music on them was “real” rock and roll. She had recorded these tapes from a record set she had called The Greatest Hits of Rock and Roll Part 2. I would soon learn this was the music she had grown up listening to…and I fell in love with it just as much as I was falling in love with the contemporary top 40 rock I had heard on that clock radio. One thing I distinctly remember from those rock and roll cassettes, was how The Coasters “Charlie Brown” hadn’t played correctly when she recorded it. For some reason, the needle kept getting stuck and repeating the same loop over and over… and when it would finally advance, it would find another loop to get stuck on. In fact, it still sounds odd to me when the first line of the saxophone solo doesn’t repeat itself several times before completing the solo. I remember waiting for what seemed like forever before I finally had a chance to hear that song in completion without the needle skips. Another year for Christmas, my Mom gave me a couple more cassettes she had recorded from her records. 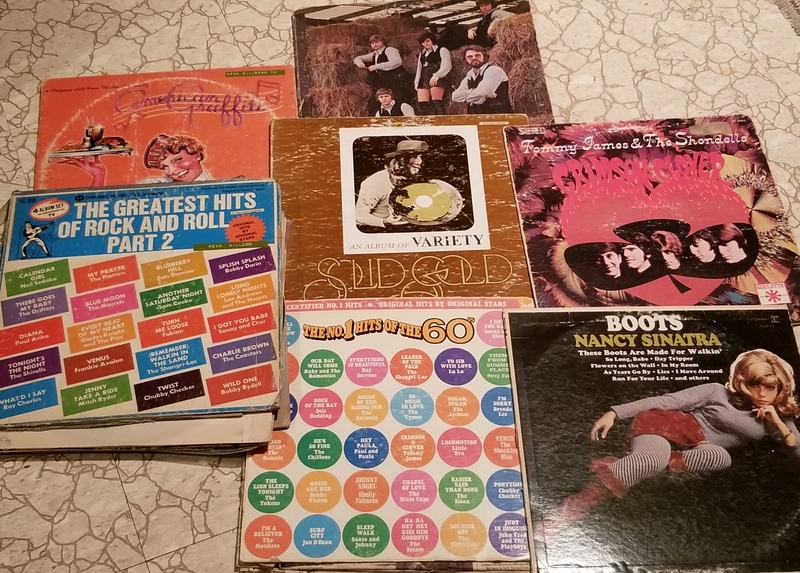 One was a recording of the American Graffiti soundtrack and the other had The Jackson 5 Christmas album on one side and Nancy Sinatra’s “Boots” on the other. In recent years, that Jackson 5 has become one of my favorite holiday records, and that George Lucas movie soundtrack introduced me to a lot more great oldies from the 50s and 60s like “Smoke Gets in Your Eyes”. While Nancy’s record hasn’t stuck with me as strongly, (except for the #1 title cut), I remember her covers of classic songs like “As Tears Go By” as the first renditions I knew. Over the years, I would discover and fall in love with more of my mom’s record collection. LPs like Crimson and Clover and Kenny Rogers and the First Edition’s Something’s Burning taught me the value of the full length album. And before oldies radio was as ubiquitous as it would become in the late 80s and 90s, compilation collections like The No. 1 Hits of the 60s and Solid Gold: An Album of Variety would introduce me to the biggest hits (like “So Much in Love” and Dizzy) and artists of the rock and roll era. 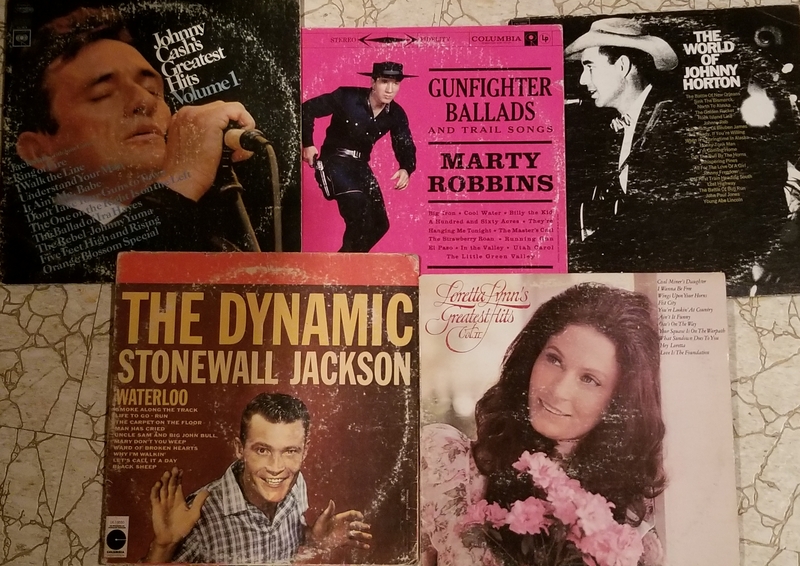 In the 70’s, Mom gave up on rock and roll and turned to country, and since Dad had grown up on country music, their record collection came to include classics from that genre. From my earliest memories I can remember Dad playing The Dynamic Stonewall Jackson, The World of Johnny Horton, and Marty Robbins Gunfighter Ballads and Trail Songs (Which I’m pretty sure was the very first country CD I bought), as well as Greatest Hits collections by Johnny Cash and Loretta Lynn. Of course, when my parents got married in the late 70s, one of the most popular formats for recorded music was the 8-track cartridge. Because my parents held onto the Zenith console stereo (the one my dad hooked their Panasonic cassette recorder to, which allowed my mom to record those tapes without background noise) they had purchased shortly after their wedding, we also kept their 8-track collection around the house. Some of my favorite memories are of nights when the TV was shut off, and Dad would put on Linda Ronstadt’s or George and Tammy’s Greatest Hits, or Eddy Arnold’s World of Hits. Of course, I probably played Elvis’s Worldwide Gold Award Hits parts 1 & 2 more than Mom or Dad ever did… actually, my first remembrance of the hits on that collection are from a tape they must have given me while I still had that Fisher Price player. I can still hear the crosstalk that showed up in the silence between the songs. As the 80s grew on, Mom and Dad invested more into a cassette tape collection. I remember Dad picking up hit compilations by the likes of Conway Twitty (before I realized his career has started with rock and roll, songs like Lonely Blue Boy seemed almost out of place among his later country hits), Don Williams, and Jim Reeves. At some point, they became members of the RCA Music Service, which allowed them to update the tape library with 80’s country like The Judds Rockin’ with the Rhythm, Randy Travis’s Storms of Life, and Ronnie Milsap’s Greatest Hits Vol. 2. I remember dad playing those tapes in the fancy auto-reverse deck in our Ford pickup, on the way to the lake for camping, fishing, or mushroom hunting. Other fine selections that came from the record and tape order club included Oldies collections like Million Dollar Memories, which featured classics like “A Teenager in Love”. But one of the crown jewels of the cassette collection was a 3 tape compilation called Summertime Gold which introduced me to more oldies classics like “Sunny and The Night Chicago Died”. I have so many memories playing those tapes while playing “house” with the kids my mom was babysitting… setting up the dining room chairs with our Child Guidance toy steering wheel, and portable tape player in my pretend/make-shift car… driving the “family” around for hours. I definitely feel like I’ll need to make more mixtapes featuring the music my parents introduced me to. I’ll probably have to make a separate mix dedicated to the oldies my mom listened to, and another one specifically of my Dad’s favorite classic country. As I skimmed over the mix tonight, trying to get back into finishing this write-up, I was pretty impressed with how well the rock and roll came together with the country selections, and how well the tracks transitioned together. This might be one of my favorite mixtapes I’ve done yet. Thanks Mom and Dad, for the amazing memories, and for supplying a major part of the soundtrack of my life.